How can I Keep Wasps Away from my Hummingbird Feeder? A hummingbird and wasp on a hummingbird feeder. A hummingbird feeder is a great way to attract hummingbirds into the yard, but wasps can also be attracted to the sweet nectar. There are a few things you can do to keep your feeder wasp-free. Wasps and bees are attracted to the color yellow while hummingbirds are attracted to red. Often red feeders come with yellow plastic flower petals surrounding the drinking hole. Yellow is only there to make the hummingbird feeder more attractive to buyers, not to hummers. Try painting the petals red, but be careful not to get paint too close to, or inside the drinking hole where a hummer’s beak might scrape paint flakes off into the nectar. Be sure the paint is dry before re-hanging the hummingbird feeder. Some feeders are designed so that hummers must dip deeply for nectar, too deeply for an insect’s proboscis to reach. This type naturally discourages wasps and bees that might smell the nectar but will soon abandon the cause of attempting to get to it. In other cases people have found that the easiest way to deal with wasps and bees at a hummingbird feeder is to give them their own “feeder” with super-saturated sugar water. This could be something as simple as a shallow plate. 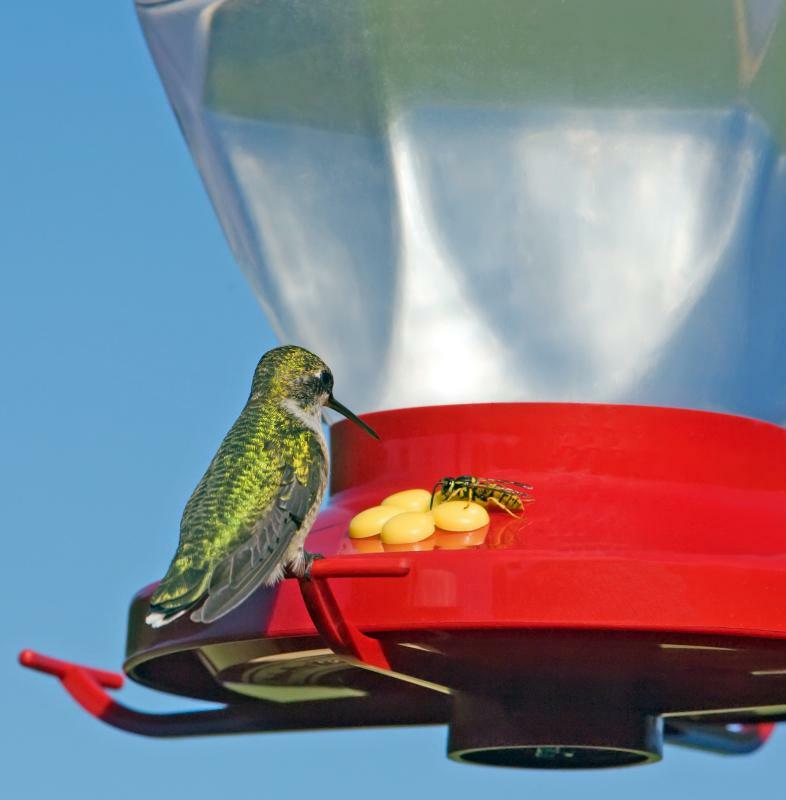 Hummingbird nectar is mixed as a 4:1 solution, so be sure the wasp nectar is far sweeter. Move the wasp’s plate away from the feeder a foot each day until it located a good distance away. The insects will gravitate with the sugar-rich plate, leaving the hummingbird feeder to the hummers. Yet another solution that works for some is to simply relocate the hummingbird feeder once wasps have discovered it. Hummers will find the feeder even if it is several feet away, but wasps and bees will take awhile to catch on. When they do, you can move the feeder again. This solution won’t work for window feeders but can work for yard feeders. Finally, some people recommend using a tiny dab of castor oil on the petals or tube surrounding the drinking hole. Insects are reluctant to stand on some surfaces, and will be discouraged from the feeder. However, do not get oil in or near the drinking hole. The stance of a wasp or bee is such that oil at the hole is unnecessary, and you want to avoid contaminating the nectar or creating a situation where hummers get oil on themselves or their beaks. Note that oil will run in heat, so apply very carefully – a thin, tiny smear with the fingertip will be sufficient. What are the Different Types of Hummingbird Feeders? What is the Best Way to get Rid of a Wasp Hive? How Do I Get Rid of a Wasp's Nest? I put some cooking oil (any kind: vegetable oil, etc.) on a paper towel and wipe it on the feeder and around the flower where they drink. Don't be afraid to use a lot. It won't harm the birds, and this really works! Do it each time you change the feeder. I use eucalyptus and peppermint oil I purchased at the health food store. I just took a bit of gauze and tied it around on of the flowers and placed a couple of drops on it. The wasps and bees hate it and stay away from my feeder. I will try mixing it with margarine to see if it will last longer. Thanks for the idea also of olive oil. WE live in Tulsa and have red wasps and they are very nasty. They chase the hummingbirds, so I get my fly swatter, not really a smart idea but it works on some of the wasps. I will try some of the above suggestions but Happy Humming. Wow thank you all so much. This is the first year I have had the wasp problem. 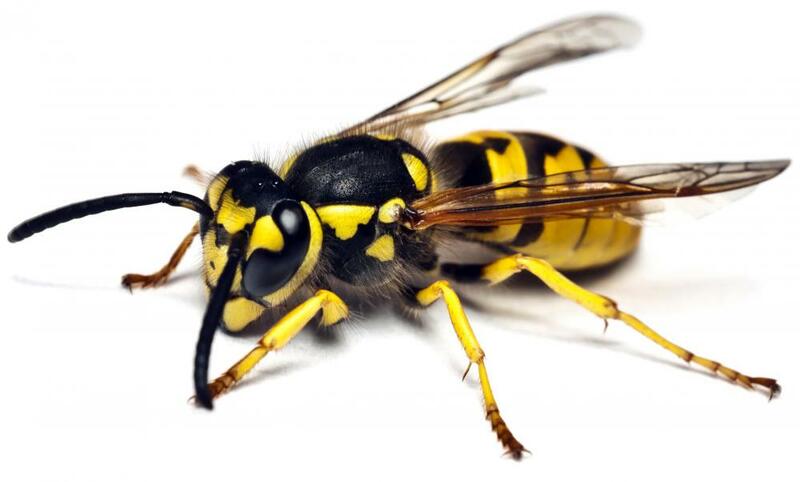 I just went out and, clearing over a dozen wasps away, dabbed olive oil on the yellow petals surrounding each port. They immediately tried to land, didn't and now are all gone! Fingers crossed they stay away. You can hang a shallow open bowl fairly close to the feeder as the bees, wasps, yellow jackets etc. find the open bowl they will gravitate to that and gorge themselves and drown. You can move the bowl farther away from your feeder once they find it and start to use it. sparingly with oil is working pretty good. A swarm of them went away when I sprayed it with the olive oil spray and if I accidentally on purpose sprayed a few bees/wasps, they were a little annoyed. Not recommended if you have a bee allergy - have someone else do it. Take some cooking oil and apply it with your finger at the base of the feeder around the feeding ports but not on the ports themselves. get bee guards. you can order them by the bunch, or you can just buy feeders that already have them. I stopped putting out my hummingbird feeder several years ago because of the swarms of wasps it attracted. These suggestions sound so reasonable that I think I'll try again! Thanks. I recently found that the bees and wasps are attacking my feeder. It's aggravating!! Anyway, I am going to try the olive oil approach with a Q-tip application and see if that works. We do love our hummers, but they don't seem too bothered by the bees, it's just i have a 4-year-old who plays in the yard and don't want it to be a territorial thing with the wasps. I was also troubled by honey bees on my hummer feeder. I used to just go out with a glove and kill as many as I could with each swipe of the glove. The bees would become disoriented and drop to the ground whereby a firm mashing with my foot finished them off. This worked till my perches the hummers use started to break. Now I just bought a cheap all red hummer feeder and have not been troubled at all. I really don't like to kill bees (except yellow jackets) but when they started to interfere with my hummers they crossed the line. I have been troubled by wasps and hornets at my feeder. I thought the suggestion of applying oil on the surfaces the insects used as landing zones sounded good. Not having any castor oil, I tried olive oil. It has worked perfectly. The wasps and hornets take off again as soon as their feet hit the oil, and they seem to be abandoning the feeder completely after only half an hour. The hummingbirds are again eating without being chased by the insects. So far a total success! I, too, have wasps chasing my hummingbirds away. Any more ideas? I have honey bees swarming my hummingbird feeder. I painted the yellow parts red, put vaseline on them and put a higher concentration of liquid in a saucer and over a week moved it around the side of the house. I put the feeder out today and it is swarmed again. Any other suggestions?